You now have access to the same cruising forecast technology used by the top navigators in the world! Planning your trip with a good wind weather forecast is one of the most important aspects in cruising. Whether you are cruising around the coast or heading offshore, PredictWind will help make your passage safer, faster and more comfortable. When the safety of the crew and boat is at stake, you will want the best marine forecast available. Often local marine forecasts are conservative and report the expected maximum wind speed over a large region. With a PredictWind forecast map you can see the whole region, and know exactly where to expect the areas of high wind speed to help plan your passage. The Basic Package is great entry level package for those not venturing too far from home, but want the most accurate cruising marine forecast available. The graphs of wind speed and direction use the most accurate 1km resolution forecast, along with the 1km and 8km resolution wind maps. Zoom in of the forecast maps to appreciate the detail and resolution of the forecasts. The Basic Package allows you access to the accurate 7 day forecasts so that you can plan ahead. PredictWind is ideally suited for coastal cruising, where you want to see how the wind weather pattern will vary over the whole area. How close are the strong wind areas? Where are the best places for anchorages and shelter? When are you likely to get favorable winds? You will be surprised at how viewing a forecast wind map will help you plan the trip with confidence. The Standard Package will give you access to the 8km resolution forecasts, which are essential for coastal cruising. You will have also have access to the Predictwind Android iPhone/iPad Apps, so you can get the latest text forecast on your mobile at no extra charge if you don’t have access to your computer. 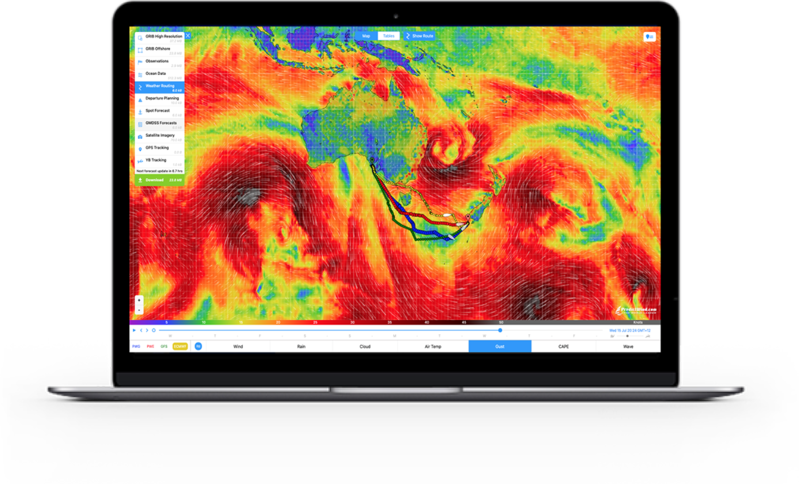 PredictWind now includes the world´s first online weather routing. Watch the video on Weather Routing. Simply drag the start and end waypoints on the map, and the PredictWind server will calculate the fastest route or the most comfortable route for your boat using the high resolution 1km-8km wind forecasts. The comfortable route allows you to avoid sailing in strong winds or large waves. You decide your tolerance level, and the PredictWind routing algorithm will avoid these regions in the forecast if possible. You simply need to define your boats’ polar and the optimal path is calculated for both PredictWind forecasts PWG and PWC, and the highly rated ECMWF and GFS forecasts. The routing algorithm is also clever enough to avoid the land, right down to the 20m resolution level. So now you can can accurately see your optimal route for coastal cruising – for Comfort or for Speed. What is the best day for depart on your next coastal passage? Watch the video on Departure Planning. You will be spanning different weather patterns, and this powerful tool will quickly summarize the wind conditions you will receive if you left on Day1, Day2, Day3, or Day4. This tool will save you hours in your planning. Simply drag the start and destination waypoints on the Map, the weather routing algorithm will calculate the fastest route (avoiding the land) and summarize the wind forecast data for the next 4 days of departure. The Standard Package is suited for coastal cruising. Use the Free GRIB Viewer to automatically download and view the PredictWind 50km resolution GRIB files and display in your navigation package. This tool is ideally suited for retrieving the forecasts over slower wireless internet connections and will ensure you always have access to the forecast when there is no internet connection available. PredictWind now includes the world´s first online weather routing. Watch the video on Weather Routing. Simply drag the start and end waypoints on the map, and the PredictWind server will calculate the fastest route or the most comfortable route for your boat using the high resolution 1km-8km or 50km resolution wind forecasts. The comfortable route allows you to avoid sailing in strong winds or big swells. You decide your tolerance level, and the PredictWind routing algorithm will do its best to avoid these areas. You simply need to define your boats’ polar and the optimal path is calculated for both PredictWind forecasts, PWG and PWE, and the highly rated ECMWF and GFS forecasts. Whilst offshore, getting access to the internet is expensive with satellite communications, and file sizes are limited with SSB radio data services. PredictWind has the ultimate solution for this problem – Routing service via email. The same weather routing package is available via email. Simply email your start and end destination waypoints, and the PredictWind server will email back the optimal route for both forecasts. The file size is under 10kb keeping your satellite connection time to a minimum. The Professional Package is recommended for offshore cruising in areas that have significant Ocean Currents, otherwise please select the Standard Package. 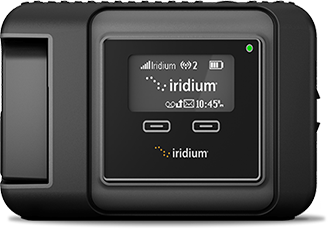 I just installed the Iridium GO! a few days before taking off on our 28th trip to Fiji on our 48′ yacht Trumpeter. Midway between Auckland and Savu Savu, Fiji we were sailing along brilliantly at a very nice 8 knots broad reaching in 22-24 kts. It was my wife’s watch and just on sunset and my time to go down for some sleep. Normally in the “old days” I would have put another reef in just as most cruisers do for the night to avoid any fire drills while I was down. It was just so nice I didn’t want to change anything! The perfect tool was to get the immediate PredictWind 4 forecasts and see what was predicted for the rest of the evening. The PWG/PWE/GFS/ECMWF all agreed that there should be no more wind above the 23 knots so we left the rig as it was. It was one of the best sailing nights we have had in a very long time. The wind settled down and stayed in the predicted range. Without Predictwind and the GO! we never would have had the confidence to maximise that moment. I graduated from the Satellite Communicator to the Iridium GO! and it was the best move we have ever done on our boat. We were tracked by friends, we had great email abilities and SOS features that has raised the bar again on offshore safety. With all that and the ability to get four accurate forecasts from Predictwind, I just think every cruising vessel should have Predictwind and the GO!